David Mann plays Mr. Brown in "Meet the Browns"
ATLANTA, Georgia (CNN) -- You are about to meet Mr. Brown. David Mann and Tamela Mann -- a real-life couple -- star in "Meet the Browns" as father and daughter. He's David Mann, star of the TBS sitcom "Tyler Perry's Meet the Browns." To borrow a phrase from the network's marketing -- he's very funny. Mann's character -- "Downtown" Leroy Brown -- is a lovable, sometimes outrageous and always off-the-wall senior citizen who has stolen every scene he's entered in Tyler Perry's plays, movies and TV shows. Mr. Brown no longer has to steal scenes, because TBS -- owned by CNN parent company Time Warner -- has ordered 80 episodes of half-hour comedy, based on the success of 10 pilot episodes. "Just in case I'm dreaming, don't pinch me," said Mann. "I'm living the dream." "Meet the Browns" is a spinoff of Perry's "House of Payne," a sitcom that has yielded strong cable ratings for TBS, and it employs some of the same characters seen in Perry's movies and stage plays -- including a play and film named "Meet the Browns," which is only mildly related to the TV series. 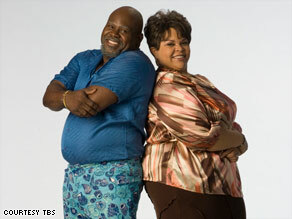 The show focuses on Mr. Brown and his daughter Cora, played by Mann's real-life wife, Tamela Mann, as Mr. Brown tries to turn his house into a home for the elderly. Those who have followed Perry's productions know that Cora was the conceived during a brief fling between Brown and Madea, Perry's female alter ego. "If it hadn't been for Cora, Mr. Brown and Madea probably would have killed each other by now," Mann said. "Cora is the glue to this whole thing. Cora keeps everybody grounded." Mann said Mr. Brown's speech and mannerisms are from a combination of people. "Grandfathers, uncles, relatives, you know, different friends you see." he said. "I use to go to a nursing home and just look at people, watch -- 'OK, that's how they're doing this.' "
His biggest laughs come from his use -- or abuse -- of the English language which Mann refers to as "Mr. Brownisms." Manipulate becomes "manipudip," while hypnotize transforms to "hepatitis." "You hear them as I spit them out, and it's just like, 'What was I thinking?' " Mann said. Mr. Brown's wardrobe, which is always two sizes too small for his protruding belly, is a bright-colored mix of thrift store specials. "The clothes just kind of happened," he said. "Because, you know, you have that uncle or that relative in your family who just can't let the clothes go?" Since Mr. Brown originated on the stage -- in Perry productions -- Mann had to adjust to the small screen. "I'm very animated and so I just had to make sure I toned that down for the screen because I'm so used to making sure that the person in the front row can see as well as the person in the balcony," he said. "To bring that and condense it down for television was a transition for me." Camera operators are challenged to keep up with Mann as he moves around the set, sometimes re-writing the script. "One word can trigger a whole different thing with us, and that's what I love about working with Tyler Perry," Mann said. "He gives you the freedom to go in there and create. If you see something that can make it funnier, he gives you the liberty to go ahead and do it, create it and make it funny." Perry directs every episode at his new Atlanta studio on a sound stage next to where he also tapes "House of Payne." Mr. Brown never seems too far from Mr. Mann. "Oh, he can come out any time," Mann, speaking as Brown, said. "All you got tuh do is say it, and he'll come. Yeap, Mr. Brown is always 'round somewhere. You jes' got tuh belieeeeeve." The character is played about 30 years older than Mann, which causes some confusion out of costume and in public, he said. "What's funny is when people see me out they're like, 'Are you Mr. Brown's son?' No, I'm Mr. Brown," he said. "But that's good for the makeup team." Perhaps the most awkward time is when he is on the set, dressed as Mr. Brown, and he wants to show his wife, Tamela Mann, some husbandly affection. "She is like, 'When you put that makeup on, you are Mr. Brown, you're not my husband.' " he said. "So, she doesn't want me kissing on her and stuff. She says 'it's like a dirty old man kissing and hugging on me.' "
You can also see Mr. Brown in "Tyler Perry's Madea Goes To Jail," which hit theaters last month and has been a rousing success at the box office. "They finally got Madea," Mann said. "She's been to jail a few times, but this time Madea goes to prison -- or as Mr. Brown would say, 'prisnuh.' "